SAN BERNARDINO — After last week’s storm, which brought considerable moisture and new grass growth, officials with San Bernardino National Forest are reminding the public of planned ecological restoration efforts using prescribed burning throughout the forest this winter. The prescribed burns, which will include both broadcast and pile burning, are planned for areas in the San Jacinto and San Bernardino mountains. The first burn could occur as early as Friday, January 19 in the San Jacinto Mountains. "In order to safely defend structures and put firefighters between homes and a wildfire, we need to create defensible space," said Jaime Gamboa, the forest fire management officer. "Just like homeowners clearing brush around their homes, we want to clear heavy fuels around communities." Timing of prescribed burns depend on a number of factors, including air quality, winds and moisture levels. Those conditions will determine where the first burn in the San Jacinto Mountains will occur. The projects take years of planning. When that and preparations are completed, firefighters must wait for a window of time when conditions are safe for burning. Numerous projects are ready for the San Jacinto Mountains. A broadcast burn, in which fire is applied to the land within a boundary, is planned for Thomas Mountain near the community of Anza. Three pile burn projects, where trees and shrubs are thinned and piled, are planned for areas around Idyllwild. As dates for the prescribed burns become clear, the public and media will be notified beforehand through media advisories, the Forest website and social media channels (Twitter and Facebook). Firefighters and staff will reach out to communities on the ground. Other prescribed burns for this winter season are planned for areas near Big Bear and Angelus Oaks in the San Bernardino Mountains. Locations and more information can be found here. Prescribed burning helps restore ecological functions to the forest. Fire has a natural role in coniferous regions of San Bernardino National Forest. Caused naturally by lightning, fire has long maintained the health of forests, clearing brush on the forest floor and releasing seeds from pine cones, among other natural processes. Aggressive firefighting and development within the forest over the past century has allowed fuels to unnaturally build up. That means an overabundance of flammable brush, which can enable wildfire in quickly spreading into the canopy and toward communities and infrastructure. Thinning forested areas helps protect communities and infrastructure. One of the major ecological functions of the forest is intertwined with millions of Southern Californians. Overgrown forests decrease the amount of water sent downstream into cities. 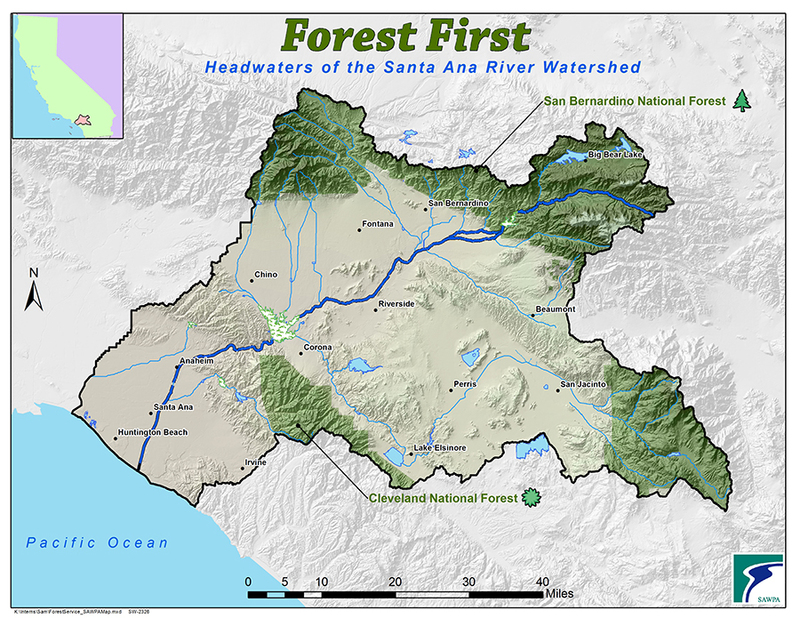 The San Bernardino National Forest serves a number of watersheds, including the Santa Ana River Watershed. This watershed provides most of the drinking water for over five million downstream Southern Californians, according to the Santa Ana Watershed Project Authority. Statewide, national forests provide California with 50 percent of its water. The mission of the U.S. Forest Service, part of the U.S. Department of Agriculture, is to sustain the health, diversity and productivity of the nation's forests and grasslands to meet the needs of present and future generations. The agency manages 193 million acres of public land, provides assistance to state and private landowners, and maintains the largest forestry research organization in the world. Public lands the Forest Service manages contribute more than $13 billion to the economy each year through visitor spending alone. Those same lands provide 20 percent of the nation's clean water supply, a value estimated at $7.2 billion per year. The agency has either a direct or indirect role in stewardship of about 80 percent of the 850 million forested acres within the U.S., of which 100 million acres are urban forests where most Americans live.